Almost ten years after the first call for bids, the research carried out at Chile’s Centers of International Excellence, which bring together companies and academia, is beginning to show its first results. The R&D initiatives that seek to bring together companies and entities that generate knowledge in Chile have begun to bear fruit and show an important level of diversification into different fields of knowledge. One of these initiatives is the Program of Attraction of Centers of Excellence, managed by the government’s Economic Development Agency (CORFO), the aim of which is to improve ties between these entities, attracting to Chile the best international practices in the field. Its implementation has been successful and the international research carried out there is beginning to produce results, demonstrating the potential for local development. One emblematic case is the Pfizer Center of Excellence in Precision Medicine (CEMP), which is working on the Nirvana study to validate a new method of diagnosis of lung cancer, using sequencing and bioinformatic analysis. In this context, a liquid biopsy is being developed that would, in future, permit diagnosis of cancer through a blood sample. In addition, the Center of Advanced Microscopy in the Bío-Bío Region (CMA Bío-Bío), which reports to the Faculty of Biological Sciences of the University of Concepción in southern Chile, has recently announced its intention of opening its services to new companies through collaboration agreements. Created in 2010 under the Associative Research Program with a state investment of almost US$6 million, this Center is equipped with latest-generation laser microscopy (confocal) technology that can produce high-resolution images. At present, it has over 400 users who carry out research in 17 fields of knowledge, including human and veterinary medicine, materials science, anthropology and even the legal sector. The Center has been instrumental in producing over 50 PhD theses and 80 high-impact publications. However, research is being undertaken not only in medicine, but also in energy and agriculture. 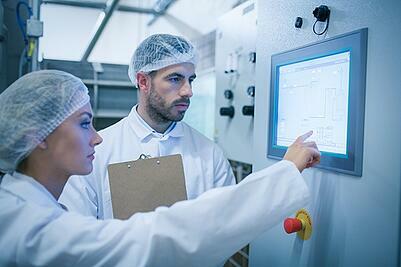 Researchers at Fraunhofer Solar and Fraunhofer Biotec have, for example, created AgroPV, a system that permits the use of solar energy on Chilean farms. Similarly, Engie Laborelec Chile and First Solar have carried out the first test in Latin America - and only the second in the world - of the active participation of a photovoltaic plant in complementary services. This demonstrated the real capacity of the 141-MW Central Luz del Norte to deliver these services. It also established that non-conventional renewable energies (NCRE) have the capacity to provide the balance services, required for the electricity system’s stability and reliability, and that their participation in a complementary services market is, therefore, possible. As of end- 2017, the Program had 12 Centers of International Excellence, with over 35 lines of R&D and over 80 projects related to sectors that include mining, ICTs, the food industry, energy and energy efficiency, molecular diagnosis, life sciences and nanotechnology. In addition, it has resulted in over 40 patent applications, 16 licenses and three spin-offs as well as some 150 contracts with industry and 36 with the public sector. It has also created a network of over 130 researchers with PhDs or Master’s degrees while the Centers represent more than 800 square meters of R&D facilities. For more about Chilean universities, read this article. Sources: Diario Financiero, El Mercurio. Chile offers a number of incentives for foreign investment. 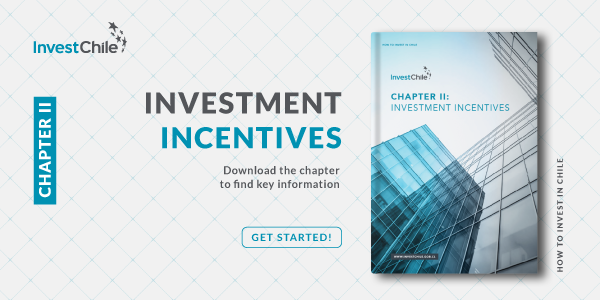 To learn more, download this chapter of our Investor’s Guide.